Celestial and Roy had been married for a year now, and they were just beginning to talk about babies when they went to visit his parents for the holidays. While they were fast asleep in the middle of the night, police broke into their hotel room and dragged Roy away. An old woman he had been kind to earlier in the evening had been raped, and although she couldn’t see her attacker in the dark, she pinned it on Roy. He went to prison for being a young black man in the wrong place at the wrong time. Their families were in shock, and a well-connected uncle immediately went to work to get Roy released. Celestial visited him regularly, and at home she toiled harder than ever to succeed in her doll-making business, along with the help of her childhood friend, André. Roy got a new cellmate, an older man who became a mentor. The years went by, and they each made a life for themselves. Nothing happened as they had planned, but they had to keep on living and making the best choices they could. Tayari Jones’ novel, an Oprah pick and on many “Best of 2018” lists, deals with a myriad of issues that tie into and flow out of one another. Certainly, racism in our criminal justice system is front and center, but while news stories concentrate on the injustice to the individual, Jones takes us inside a relationship, a young marriage that is imperfect and just trying to find its footing, but filled with hopes and dreams waiting to come to fruition. When the husband is incarcerated, it is not just a crime against him, but it also tears a rift across his wife’s life, the lives of his parents, her parents, their friends, and even the children they might have had. It creates a ripple effect spreading out from their little circle of two. Jones also examines marriage itself. All couples bring baggage into a relationship, and who can say what would have happened if Roy had never gone to jail? Perhaps he would have been successful in business, or perhaps his uneasiness about the difference in their families’ finances would have overcome him. Perhaps he would have been supportive of Celestial’s business, or perhaps jealousy may have made him petty and broken their marriage apart. Perhaps children would have healed all of their problems, or perhaps they would have thrown them into sharper relief. Celestial and Roy will never know what their marriage was meant to be, because their involuntary separation has become the defining issue of their lives, and while that may not be the true cause of every problem they face, it will certainly bear the blame. This compelling story reveals the complexities of all American families, generations filled with secrets and bound by blood, love, betrayal, and compromise. The chapters are told in turn by the main characters, giving the reader a sympathetic understanding of everyone’s perspective. All of the characters are realistically flawed, and I remember telling a colleague one morning, “At this point, I’m just furious with all of them,” but I couldn’t wait to get back home to see what happened to them. Celestial and Roy will get under the readers’ skin and stay with them long after the novel is closed. Georgie is a TV comedy writer in Los Angeles, working alongside her best friend, Seth. They’ve been partners since high school, and her husband, Neal, has learned to deal with it. Neal stays home and takes care of their two daughters, Alice and Noomi, until the Christmas that Georgie tells Neal that she can’t go with them to his mother’s house in Omaha because she and Seth have to write four scripts for the new show that will be the big break they’ve always wanted. Neal takes the girls and leaves, and through a series of strange occurrences, Georgie and Neal can never connect after that, although Georgie is able to reach the girls several times. Is Neal doing this on purpose? Wait, did he just leave her for good? Georgie doesn’t want to go to her own empty house, so she ends up staying at the house where she grew up, along with her flirty mother, whose new husband is only three years older than Georgie, and his daughter, Heather. Something strange is happening on the landline phone in her childhood bedroom, and suddenly, Georgie’s driven, Hollywood life goes screeching off into a ditch. Because of Neal’s silence, she is forced to take a hard look at the choices she’s made, not just for herself, but for Neal and the girls, as well. 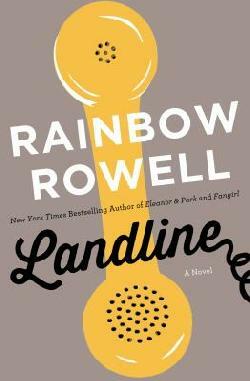 Rainbow Rowell raises some terrifying questions in this engrossing novel, such as: If you could put your finger on the moment in your life that is the crossroads, would you make a less selfish choice and change your life forever? Would you do it if you knew that you would suffer, but the ones you loved would be happier? What is a marriage, and why did you marry the person you’re with? Do you even make conscious decisions at all, or do you just go along with the path of least resistance? I’ve read all four Rainbow Rowell novels now, and this one brought to light a particular talent of hers: Ms. Rowell writes completely loveable male characters. Oh, sure, she can write an ogre like Eleanor’s stepfather, too, but her quiet heroes are wonderful in a way that only men can be. Lincoln, in Attachments, is so tentative that you want to give him a pep talk, but he is kind to his mother and even to the old woman he shares his dinner with. Park is amazing (and has parents that make you proud to be a parent), and Levi, in Fangirl, is adorable. In Landline, you’re so convinced of Neal’s goodness that you don’t know what you want Georgie to do. Well, you do want a happy ending, but even though Georgie is the main character, you’re pretty sure that Neal is a much better person than she is. He’s so worthy of her love, but you’re not sure she’s worthy of him. That is such an achievement for a writer! Georgie is a great gal, but the reader’s emotions are conflicted because the male character is so noble. This is, at its most basic, a novel about marriage—marriage as the most fundamental, life-changing relationship that it is possible to have. Georgie realizes that she has taken her marriage for granted, just because it’s so easy to do that when another person ceases to exist as “other,” and instead becomes intertwined into the self. Rowell’s gift for dialogue shines here, but she also has a couple of beautiful and witty passages that I’m dying to quote for you, but I read an advance reader copy, so I can’t do that. I highly recommend the book for adults and older teens. If you’re married, it will make you want to go hug your spouse. If you’re not married, it will make you want to skip over the cool guys or the gorgeous guys and look for the good guys. *Coming in July, 2014. If you plan to borrow it from the library, get in line now. Disclaimer: I read an advance reader copy of this book, provided by McMillan Publishers. Opinions expressed are solely my own and do not reflect those of my employer or anyone else.